The Jackson 5 had made quite a name for themselves in their hometown of Gary, Indiana and in and around Chicago, notably Chicago’s famed Regal Theater, performing in and winning several talent shows and opening for established R&B acts. 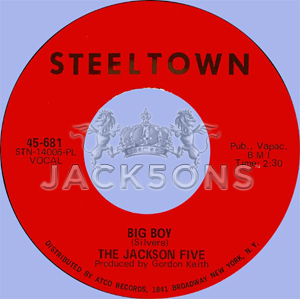 They would later perform at venues such as The Uptown in Philadelphia and the legendary Apollo Theater in New York City and also made some recordings with Gary’s local Steeltown Records label. It was at one of their appearances at Chicago’s Regal Theater in July 1968 when they opened for Bobby Taylor & the Vancouvers that its lead singer, Bobby, was impressed with the group and contacted Ralph Seltzer, the head of both Motown’s creative department and legal team, that the group be allowed to audition for Motown. At first, Seltzer had reservations but eventually gave the okay for the Jackson 5 to audition. The Jackson 5 were scheduled to go to New York to do their very first television appearance on “The David Frost Show” that same month. Michael recalled in his autobiography “Moonwalk” that he told everyone at school about their upcoming TV appearance and even had rehearsals and narrowing down which songs they would be performing. Sadly, his father Joseph told him and his brothers that their TV appearance was cancelled. “We were shocked. I was ready to cry,” Michael recalled. “We had been about to get our big break.” However, Joseph told them the reason for the cancellation: Motown Records called and scheduled them for an audition. So the audition was set up on July 23, 1968 and was filmed (since Motown chairman Berry Gordy was not present at the audition, he would review it later). It took some coaxing and nudging from Motown’s new creative consultant Suzanne DePasse, whom had seen the group perform at Bobby Taylor’s apartment, to convince Gordy to sign the group. After Gordy saw the audition tape, he was impressed. 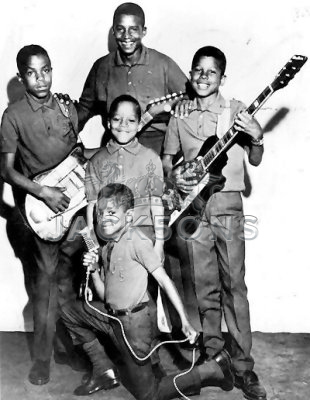 “These kids were so talented, but when I saw the lead singer Michael, he reminded me of a young Frankie Lymon.” Gordy said. The Jackson 5 passed the audition and signed with the label on July 26, 1968. After that, Motown booked the group to a benefit concert in Gary on Sept. 27, 1968 for the re-election of the city’s mayor Richard Hatcher. Other acts on the bill were fellow Motown acts Shorty Long and Gladys Knight & The Pips (whom had seen The Jackson 5 when they opened for them at the Regal Theater in Dec. 1967 and tried to get a representative from Motown to see them, to no avail) This was where the “official” Motown story began of where Diana Ross first saw the group, but she was no where near Gary at this time, but in Los Angeles doing a show with the Supremes. In Dec. 1968, the Jackson 5 performed at Berry Gordy’s mansion at a poolside party where all of the other Motown acts were guests. Gordy and guests such as Smokey Robinson, Diana Ross and others were highly impressed by the new Motown stars who were performing these artists hits with great skill. From May to August 1969, the Jackson 5 spent weekends in Detroit recording a number of songs for their first album. Motown had Joseph and his sons move to Los Angeles in August of that year while the other members of the Jackson family remained in Gary until Joseph sent for them. Now that Motown had their new group recording an album and making appearances in concerts, it was time for the group to get on television. In late July 1969, the legendary late Hal Jackson, who was a popular radio disc jockey in New York City, was producing a show at what was formerly known as the Felt Forum (now the Paramount Theater) called the Miss Black America Pageant, a talent contest for black teenage girls ages 13 to 16. This year the program was sponsored by the Motown Record Corporation and Madison Square Garden and would be televised locally in New York. Other acts that would appear on this show would be Stevie Wonder, The Impressions and the James Cleveland Singers. Berry Gordy and Hal Jackson were old friends so Gordy put in a call to Jackson. Gordy knew that Jackson was always doing things to help better the youth “so I knew this would get to him,” Gordy said. One of the songs the group had recorded for their first album was their remake of The Isley Brothers’ “It’s Your Thing” (it didn’t make it on the final selections of cuts for the album). So it was decided they would perform this number for their first television appearance. Watching this performance, Michael, at 10 years old going on 11, was a little dynamo. Jackie and Marlon danced in great unison while Tito, Jermaine, Johnny Jackson and Ronnie Rancifer played their instruments with precision, but it was clear Michael was the front man in charge. His soulful wailing on “It’s Your Thing” would have done Ron Isley very proud. Michael’s pelvic thrusts and James Brown moves were a visual treat. He even led the audience in doing soul clapping and repeating the phrase “It’s My Thing.” Michael was in control of that entire arena! When the group finished, they received thunderous applause from the audience. The television broadcast of “The Miss Black America Pageant” aired on Sunday, August 24, 1969. Although the group had no single or album yet, it did give television viewers a preview of the group. Their first single, “I Want You Back,” would not be released until October 7, 1969 and their first album would not be released until December 18, 1969. 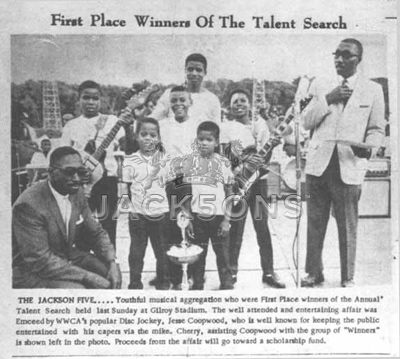 Because this program aired only locally in New York, most Jacksons fans do not really recall this television appearance. Most assume that their first television appearance was “The Ed Sullivan Show” (their actual first national television appearance was on “The Hollywood Palace” on Oct. 18, 1969). Nevertheless, because of radio deejay Hal Jackson, the Jackson 5 were able to appear on television for the very first time in their careers. The country would eventually be exposed to this great, talented new Motown group that only New Yorkers got to see that night in August 1969. As the lyrics of the song “New York, New York” goes: “If I can make it there, I can make it anywhere.” Indeed, from the audience’s reaction at New York City’s Felt Forum at “The Miss Black America Pageant,” the Jackson 5 not only made it there, but they were going to make it everywhere. Stephen McMillian is a historian and archivist of the Jacksons music and career.